NSW political party policies for feral horse management in Kosciuszko National Park. The Invasive Species Council, on behalf of Reclaim Kosci, has reviewed the policies of the major political parties contesting the 2019 NSW election and analysed their responses to a questionnaire. Here’s what we found. The NSW Greens – Rating: EXCELLENT – have listened to Australia’s best scientific experts in regards to the destructive impacts of feral horses and structured their policies accordingly. They unveiled a strong feral horse control policy as part of their $200 million increase in funding for invasive species and committed to a humane, professional cull to reduce feral horses numbers in Kosciuszko National Park by 90% over three years. 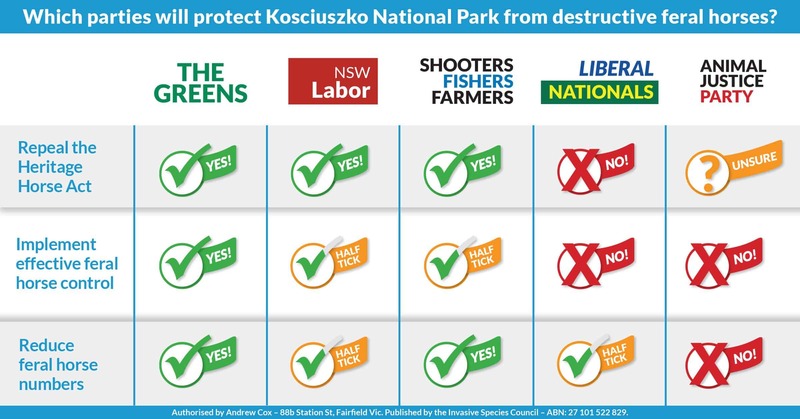 The Shooters, Fishers and Farmers Party – Rating: FAIR – have committed to repealing the Kosciuszko Wild Horse Heritage Act and following the original 2016 Kosciuszko National Park Draft Wild Horse Management Plan. This plan was created by the NSW National Parks and Wildlife Service in consultation with scientists and stakeholders. It was considered a compromise, allowing a heritage horse herd of 600 to remain in the park, achieved after 20 years of feral horse control that would include ground shooting and rehoming. NSW Labor – Rating: FAIR – has produced a six-point plan to manage horses in Kosciuszko National Park that includes repealing the Wild Horse Heritage Act, implementing a plan similar to the 2016 Draft Kosciuszko Wild Horse Management Plan and repairing mountain catchment damage. Labor will seek to rehome horses outside the park and does not specify other control methods to be used except to rule our aerial shooting. It is good that Labor will repeal the Wild Horse Heritage Act and their commitment to the 2016 plan is positive. The NSW Nationals – Rating: POOR – have continued to support a ridiculous law that prioritises the protection of a feral animal over our own native and endangered species. The party who introduced the heritage horse act has failed to respond to Reclaim Kosci’s request for information. Their scorecard results were based on verbal commitments made by Nationals Party leader John Barilaro. The Coalition’s ‘heritage’ horse management plan is not supported by scientists, makes unbelievable claims about reducing horse numbers and will rely on rehoming, an impractical method for lowering the horse population. The Animal Justice Party – Rating: VERY POOR – has ruled out any lethal forms of feral horse control. They agree that horses are impacting on the environment and native wildlife but hope to control numbers using fertility control, with relocation a last resort. While the Animal Justice Party ideals may be admirable, they are completely unrealistic. The science shows fertility control will not work in Kosciuszko National Park. The area is too large and rugged for the technology to be effective. We need real solutions, right now. Authorised by Andrew Cox, 88b Station St, Fairfield Vic. Responsibility for any electoral comment is taken by the Invasive Species Council. This information does not necessarily represent the views of any other organisation or person.